Click here to view historic sales data for Northwest Colorado Springs. 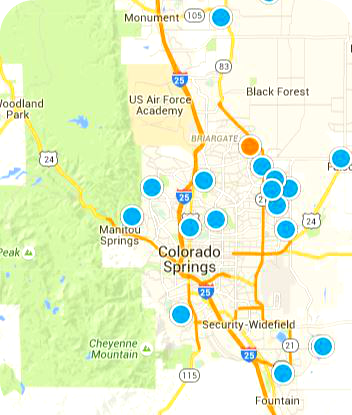 Scroll down to view the latest listings in Northwest Colorado Springs. Nestled on the foothills of the Front Range, northwest Colorado Springs includes several neighborhoods with options available at a variety of price ranges for rental or purchase. Kissing Camels, Mountain Shadows, Oak Valley Ranch, Rockrimmon, and Peregrin each offer distinct locales with beautiful views and distance from the busyness of the city. With areas of open space and plenty of amenities close by, northwest Colorado Springs remains one of the most popular neighborhoods in the city. Named after the famous rock formation in Garden of the Gods, Kissing Camels gated community offers a vast selection of home styles and ages, all with easy access to the exclusive Garden of the Gods Club. This country club grants access to the Kissing Camels Golf Club, Colorado Springs Resort Spa, professional tennis courts, and an assortment of dining options. With the trails and sights of Garden of the Gods only minutes away, this community provides an unparalleled opportunity for Colorado living. Mountain Shadows and Oak Valley Ranch mark the western border of the area, affording residents with amazing views of the city and quick access to outdoor activities. Mountain Shadows Open Space and Mountain Shadows Park provide the neighborhood with room for play just down the street from home. Ute Valley Park, on the other hand, has room for biking, hiking, and climbing, all in a huge natural setting. Rockrimmon encompasses the space between Mountain Shadows and I-25 outside of Peregrin. A well-established neighborhood with plenty of character, Rockrimmon is situated a bit closer to shopping and outside travel. Local shops and services include Aloha Detailing, Paradise Nails & Spa, and Safeway. Restaurants are available, also, without straying too far from home. Narai Thai, Salsa Brava, and Wyatt's Pub and Grill are all worth a visit. With I-25 and Garden of the Gods Road close by, it's quick and easy to reach any part of Colorado Springs from Rockrimmon. Peregrine, located just north of Oak Valley Ranch and extending to the border of the Air Force Academy, offers perhaps the most mountain-like living area within all of Colorado Springs. Blodgett Peak Open Space is the closest full-summit trail to the Springs; even Peregrine's sidewalks could be considered hiking trails due to elevation gains. However, the whole neighborhood overlooks the city, providing incredible views no matter the season. Additionally, the historic St. Francis of Assisi Catholic Church is just minutes away. Each area also offers every needed municipal service all within a short distance of any neighborhood street. The Pikes Peak Library District operates the Rockrimmon Library at Vindicator Drive and Rockrimmon Boulevard. Academy School District 20 serves all ages of students in the community in both traditional and online classrooms, and remains the highest achieving large school district in Colorado. Together, each of these subdivisions make northwest Colorado Springs the perfect place to settle down and enjoy all of the conveniences that the city has to offer.